See how VR Vision is helping some of the world’s top brands engage with XR! We provide a full range of immersive technology services to empower your business! Transform your business with custom virtual reality application development. Create stunning real world visuals using augmented reality. Use the power of the web to deliver stunning content with mobile apps. Using cutting edge technology to film stunning 3D 360 content. and bring it to the forefront of immersive technology. Improving the quality of life with technology. Enhance your marketability using the latest in augmented and virtual reality. Immersive training programs that enhance human performance. Learn how 360° video can be used to create immersive experiences for employee training. VR Vision specializes in empowering businesses across a wide array of verticals. 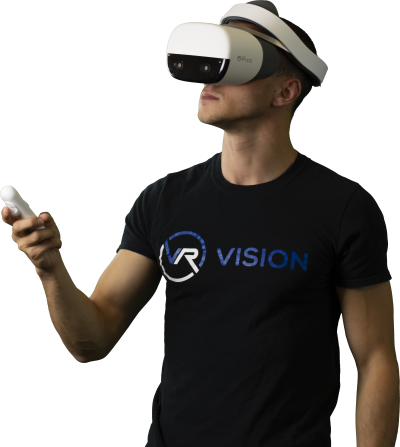 We provide both hardware as an authorized distributor, and custom content developed in-house by a team of VR professionals. Empower your company with Virtual Reality for your next marketing activation. A comprehensive and detailed approach to using the best hardware available. “We hired VR Vision Inc to build a VR-based proof of concept for fire safety training. We wanted to demonstrate to our client base that VR is a viable tool for training employees. They helped us with the instructional design of a VR course that showed factory workers responding to a fire emergency. The course went over best practices and alternative solutions for real-life situations. The team created the product with HTC Vive headsets, and compiled the footage using Unity 3D for PCs and Steam as the final player. The product has made a tremendous impact for our company; it was well received by our client base at our annual conference. We successfully demonstrated that VR is a viable training method. What’s more, our team in now implementing client feedback on VR into our sales cycle. “We are looking at doing something on-site that bridges technology and tennis together in a unique setting. We want to do something in the VR area that is engaging and fun for fans. Enter your contact details and we will get in touch with you to book a free demo/consultation to discuss immersive technology for your brand.